Southern Utah holds plenty of spectacular activities and places to see in the winter time. The blankets of snow covering the unique rock formations highlight these already postcard-worthy landscapes. A Christmas Vacation in Brian Head, Utah is like no other. Bundle up for an unforgettable trip where you can experience some of Utah’s best skiing and snowboarding, attend festivals full of Christmas spirit, and snowmobile on some of the most awe-inspiring trails in the country. Want to learn more about everything there is to do around Southern Utah? Request access to our free Vacation Guide for all of the best activities, sights, and places to eat in the area! Unwrap Your Southern Utah Vacation Guide! If you’re dreaming of a white Christmas, your Brian Head certainly doesn’t disappoint. There are plenty of ways to get outside and enjoy the fluffy white stuff while you are in town. Brian Head Resort features plenty of top-notch skiing, snowboarding, and snow tubing. Snowmobiling is one of the most fun and unique activities in Southern Utah. Sure, there are plenty of places in the country where you can snowmobile through woods and backroads, but few places present you with the jaw-dropping scenery of Dixie National Forest and Cedar Breaks National Monument. These red rock formations dusted with snow are a feast for the eyes as you go for an adrenaline-pumping ride. Thunder Mountain Motorsports is the best place to rent your Brian Head snowmobile. The Duck Creek Village Christmas on the Mountain is a great event for families with small children. Kids can meet Santa in the afternoon before everyone walks to the big Christmas tree in the center of town for cookies and the lighting of the tree! Enjoy refreshments as you mingle with residents and other visitors. Plenty of Christmas shopping and entertainment await you at the Dickens Festival in St. George. Stop and grab some early Christmas gifts for your loved ones or yourself! Carolers, ghosts, and Ebenezer Scrooge wander through the crowds, making you wonder if you are actually in mid-nineteenth century London. Zion National Park has natural beauty around every corner. Explore the towering sandstone cliffs and the narrow canyons. Whether you’re hiking, taking photos, or going for a scenic drive, a visit to this national park is a must. Endless plateaus, red rock formations, and the largest concentration of hoodoos (irregular columns of rock) found anywhere on the planet are the major draws to Bryce Canyon National Park. There are tons of fun winter activities like hiking, snowshoeing, and sightseeing! For other winter activities and events, check out our guide on how to have a holly jolly Christmas in Utah! No Christmas Vacation to Brian Head is complete without a stay at a Family Time Vacation Rentals property. Our homes and condos offer the best amenities, locations, and cozy spaces for family fun. 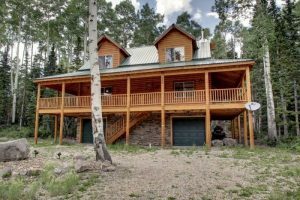 Check out our Whispering Pine Lodge property in Brian Head! It has three bedrooms, two garages, and a sauna. It sleeps up to eight people and is less than a mile from ski lifts and snow tubing. Whispering Pines Lodge is also two miles from Cedar Breaks National Monument and features an area to park snowmobile rentals. This property has everything you need for the perfect family Christmas vacation! Ready to book your holiday trip? Check our availability and request access to your free Southern Utah Vacation Guide!